A recipe requiring those pesky (and always useless) Lightning Eels finally surfaces! Azerothian fishermen everywhere rejoice. Then zap people with lightning. Lighting proc has a 15 yard radius, has an 8 second interval, and hits for 660 to 670 Nature Damage. Remember that The Rokk won't be available till Patch 2.3! Note that this is more of a "toy" weapon/buff than an actual offensive spell. Some of other recipes obtained through the Daily Cooking Quest are also pretty Lame when it comes to usefulness, like the Chocolate Cake. Quite nice for a small amount of extra threat-generation. The ranged component can be particularly useful for Warriors and Bear-tanks. It'll allow them to generate a small level of AOE threat, similar to a Pally's Consecration. It's only 53 to 67 damage. But it may also help change the mind of an undecided mob, who has just left melee range, and headed toward your healer. Is this modified by +damage? I just dueled a warrior that had this buff, he wanted to check out what it did. I was only getting hit for about 20-30 most of the time. Does this buff take the place of a Well Fed buff from other food? Yes, it will not stack with other Well Fed buffs. This is going to be a fun food, kinda how dragonbreath chili was. I can't wait. I just got this recipe, from the crate of meat that is a reward from the cooking daily. At Blizzcon during the item panel, the dev's said that eating this and standing next to a critter or mob in the rain would have a "special" effect. Waiting to try this out as soon as I get the recipe. Just got this one on Silver Hand from a barrel of fish - can't wait to play with it. The daily cooking quests are looking great. I just got this from a box of meat as well. Now to get my fishing skill up. These things quite literally BBQ critters. In testing it tonight after getting the recipe, I hit critters in Outland for anywhere just above or below 700 damage. However, I don't expect this to bring a whole lot of extra threat to the party in dungeons and whatnot, it seems to only hit mobs for about 20-30 nature damage. Basically cosmetic critter frying. 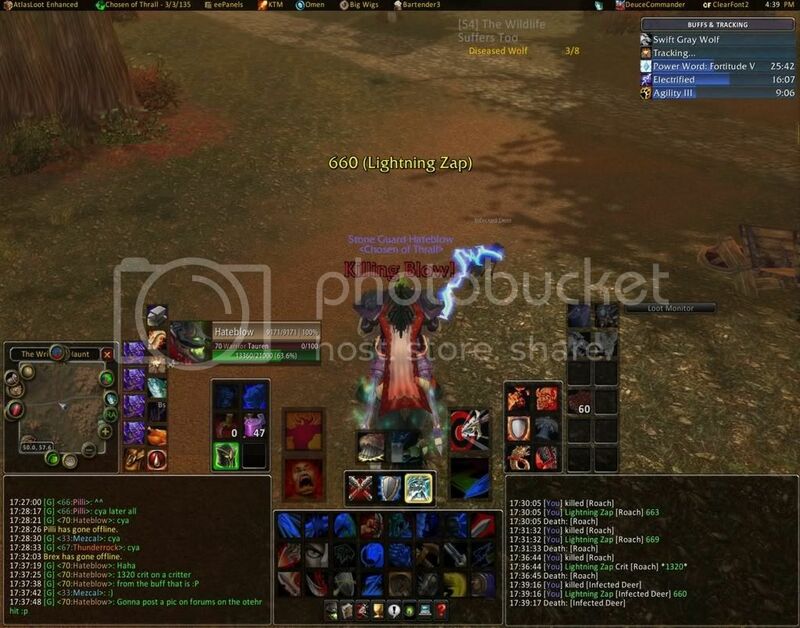 /edit: Apparently it can crit as well... One of my procs this afternoon hit a rabbit in Goldshire for over 1600 damage. i got this recipe on a meat crate on my first cooking daily,pretty nice. IF you are a tank, and want a food buff, Please, use stamina. Don't bother with the sheep-fryer, Go with what might let you take an extra hit. If the mob's "Just left melee range", use Piercing Howl. If you're all prot, and it got away, reroll. You don't need maxed Cooking to get this - I have 368 and got it last night for my Daily Cooking quest. ...has no one else thought of this question.....WILL IT BREAK SHEEP?? I found that this will break sap when I was running around with a rogue friend, so I imagine that it will break sheep too. got it today out of a crate of meat after doing 'Soup for the Soul' quest. im very happy to say the least. I think the special effect in the rain is that lightning will strike twice in a row. It was raining in Azshara, so I rode everywhere looking for a critter. Had to settle for a Mosshoof Courser. After a most interesting Kara run...yes, it will break any cc available. Lovely boost to multi threat, but be extra careful about pulling far away from other mobs. Got it from my very first daily cooking quest ever. Lucky i guess, i picked meat crate. One of the most amusing new foods they added. Now if only they'd add more rare show off fish other than Old Crafty and Mr. Pinchy I'd be content as a fisherman. Eels are easy to fish next to kara. I got this recipe a couple weeks ago and enjoy it very much. woot! just got this on my first time doing the cooking daily! Western Plaguelands is the best place to fish Lignthning Eel. Use the UC portal in Shat, then a short mount run to The Bulwark. I assumed that you are Hordie, sry Allies. As of the last time I did Mag's Lair, this did start the boss fight a bit before we were prepared. Another great use for this is farming the bog giants etc in the dead mire... as they tend to roam in groups it helped me pull aggro (unintentionally) and made pulling groups of 5/6 at a time a lot easier when farming primal life. If you're boosting on a run in SM Cat it would be hella funny running around with this on. Oh, and ofc there are lots of critters there too. after 30~ daily cooking quests. Been looking for this recipe for a while, just got it from the Dalaran cooking daily. It was in the spices bag in addition to some Northern Spice and a cooking award. It was the Convention at the Ledgermaine quest. I have done this daily every single day since release of the cooking dailies for 3 toons and I still have not got this recipe. I still have hope but man is it frustrating. Hopefully Blizzard will add this to Northrend cooking rewards, similar to Delicious Chocolate Cake. I've been doing daily cooking quests for months. Shattrath and now Dalaran...every day. If I miss any its the Shattrath one maybe once a week..but its rare. I have yet to get either the Stormchops recipe or the Chocolate Cake one. They need to up the drop rate on things like this or make it so that these don't need to be cooked for the achievments. This is about the most frustrating thing I've dealt with in this game. Finally got the chocolate cake recipe today. About 3 months of trying. Now for that pesky Stormchops one that keeps eluding me. And I did get this from the Dalaran Cooking quest..the one with the carrots from below Dalaran. where do this recipe drops ? I've been doing the Shatt daily for 2 weeks now, and have yet this drop for me. Only missing Kibler's bits and Stormchops. I'm currently doing that damned daily for this and the cake recipes and the feeling that i deleted this recipe in the past doesn't leave my head and in case i don't get either in 1 week I'll start making a ticket everyday, tired of this daily. Talk about that under the cake, not here. 1 Week? I've been doing the daily for over a year and I haven't gotten it to drop. I'd say i've done this daily at least 300 times. I'm not qq'ing and opening a ticket. that just wastes the GM's time for actual important issues. The delicious chocolate cake recipe has a chance to drop from the dalaran spice bag from the cooking quest reward, i just got mine this morning, not sure if stormchops is the same. didnt you know that ? For anyone wondering if Stormchops 'still' drops from The Rokk's cooking daily, it does. I've been running the old Shatt cooking daily for months waiting for this %$#% thing ... and it finally dropped today from 'crate of meat'. If you check the page for Small Spice Bag from the Northrend dailies you may notice that while Wowhead has (at the time of posting) registered 630 drops for the chocolate cake recipe (~.9%), there are none for the Stormchops recipe. Downrated why? I merely stated that you can also fish up Skullfish around Karazhan too, not just ZA. Atm, Ive basicly gotten every recipe except stormchops. Just wondering, you who has gotten it, have you got better luck from crates of meat or from barrel of fish? Atm Im takin the barrel every day, wonder if there is any need for swapping back and forth between them. As of patch 3.0.8 this recipe can now come from spice bags in the Dalaran cooking dailies. Confirmed. I've been doing both the Dalaran and Shattrath quests each day, but it was definitely the Dalaran quest that gave me both the Stormchops and Chocolate Cake recipes. Also confirmed. You might also want to know that i've been doing cooking daily in Shattrath for months and just got the recipy from Dalaran cooking daily on the third day of the patch 3.0.8, conclusions are all yours.. Same here. Only about 2 months, but got the cake recipe after my 2nd or 3rd daily. Just picked this one up tonight. My new cooking alt toon has only ever done the Dalaran dailies. Dropped today on the 12th spice bag, which also happened to be 3rd daily he's done since 3.0.8. Guess it's a fairly kind drop rate. how a useless comment like that got this score? Ive been quite unlucky with geardrops, prospecting but it seems im extremly lucky with cooking, got recipe: delicious chocolate cake on my first cooking dayli in dalaran. I also just got this today from the Dalaran cooking daily. I wonder if the drop rate hasn't been significantly increased. I have now obtained 109 dalaran cooking awards, and at the same time done every shattrath city cooking daily since 13th of November 2007 where the cooking dailies started in 2.3(i have missed a few days,but this is the first thing i do every time the dailies reset every day) and im still without this recipe. It's gotten so far out that people in the guild started mocking me everytime they get one ! Also this is the last recipe im missing for the Chef achievement just to top things off. Can anyone confirm that this still drops off the daily cooking quests in Shattrath City? Does it work like active aoe or rather passive? if you tag a mob while running, will it go after you forever or quit after couple of seconds? confirmed. just picked one up today from the spice bags. chef title here i come. oh and for those that are wondering, i picked up quite a few eels in feralas by the water near diremaul, while leveling. happy hunting ! I wish they added this to drop from the dalaran cooking dailie. Also as a sidenot I just wish they add some other more unique types of food like this one in the future. just love to have some other things then just pure stats from buff-food e.g stormchops, dragonbreath chili, and well I guess there might be a few more but well these are not that viable anymore. Do you even read? It clearly says that it's been added to the Dalaran cooking daily, a comment just almost above you say that. Finally had a drop today from The Rokk in Shatt. After two weeks of taking Crate of Meat, which gives a slightly higher drop rate, for the hell of it I took Barrel of Fish...bam...there it was! Happy to never have to talk to that goblin again! In my almost 3 years of playing this has been the most frustrating thing I've ever dealt with in game. Have been doing the Shattrath and Dalaran cooking dailies for ages, but still no Stormchops for my rogue. It's the final thing I need to get the Chef title, and I agree that it's extremely frustrating and pointless to have to do these quests day in and day out. Collecting mana berries isn't THAT funny. EDIT: And two days later it dropped from Dalaran spice bag. Dear God, thank you! Got this on my second daily cooking reward in dalaran. only 2 dailies and i had this. lemme say that one more time while you cry. 2 dailies. btw fantastic food for warrior tanks, like a permanent consecrate with rez sickness. Same here. Done both cooking dailies pretty much every day over the last 3+ months, and have yet to see it. Last thing I need for Chef title, so f**king frustrating. This recipe is driving me completely insane. I have been doing the daily cooking quest in Shat pretty much since they where released... and I still haven't got the recipe. I Also have been doing the Dalaran Daily quests for cooking, every day since release.. maybe a couple I missed here and there.. Would be nice to actually get it..
Got mine from a Dalaran cooking daily bag. Very cool recipe, and it doesn't override other food buffs. Got this today on my fourth cooking daily! Most of these comments are whining that you don't have it- is there anyone here with it that can give any useful info about how decent it actually is? Are you asking how often it procs? Fairly often from my experience, especially in a critter filled Naxx or similar. Its just a toy / fun buff, kind of like the (rarer) Sleepy Willy's eye beam or the Iron Boot Flask lightning strike, useless otherwise. Have been doing both Dalaran and Shatt cooking dalies since Dec noow its April, still no stormchops. This is about to drive me crazy. This is also the only and only thing standing between me and the Chef title. Well finally i got this recipe... it was the only one i was missing from outlands. Droped from a Small Spice Bag from the quest Convention at the Legerdemain. Just got this from The Rokk in Shatt. I chose barrel of fish after completing the "Manalicious" daily. Was very shocked that I got it, especially after reading the frustration of others on trying to get this, yet to no avail. The recipie for Savory Delight also dropped for me in the Barrens today too. Must be my lucky day! Indeed! What's with the weird drop rate? I have been doing both Shatt and Dalaran cooking dailies for the last month trying to get this recipe. I chose the Crate of Meat every day because it listed as slightly higher drop rate on WoWHead. Today I got sick of it and after reading a few comments getting it from Barrel of Fish, I chose the barrel myself. Lo and behold ! Stormchops recipe! I have been doing this quest for going on 6 months. I've tried the meat, I've tried the barrel of fish. This is the ONLY thing keeping me from the Chef title. I also do the Dal cooking quest every day. Has anyone seen my hair? C'mon Blizz! Up the drop rate a smidge! Same here, driving me insane! I have been doing the dailys for the stormchops recipe every day possible since prior to WOTLK release/achievements existing and have yet to see it. Couldn't agree more. You get welfare epics everywhere and yet one recipe never drops. Been doing these quests pre Wrath and still not got it. Come on Blizz - the RNG shouldn't rule everything! This recipe is seriously making me consider putting my fist through my monitor. Like many, it's all I need for my Chef title. Yet that stupid Goblin Won't. Give. Up. The. Goods! I may just have to lay the smack down on him. Just got this in by small bag of spices. I just did lvl up cooking on my Paly so I could do the dailies and got the recipe just after a few days of the daily. Just got it out of my second cooking quest reward in Dalaran haha. Now if I could've just used that bit of luck on the fishing mount. Wow, you guys will prolly hate me, first cooking quest on my pally I got it, but can't get it for the life of me on my priest. Edit. Dalaran cooking quest that is. I did the Shat cooking quests religiously, and never got this. Same with the Dal quests. This needs to be purchasable with cooking awards or something. This is the only recipe holding me back from my chef career! Please Blizzard make this obtainable in ways other than RNG! This can also be gotten from Dalaran cooking dailies. this is the last recipe that i need for my stupid chef title and i have been trying to get it like for a stupid month and it would not drop. anyone have a similar problem? I've been trying to get it for 2 months now, doing both cooking dailies. This and Bad Clams are the only recipes I need for the Chef title. As of yesterday (9/12) Stormchops is all I need for Chef. ACK. Same here. It's been a couple months and nothing. It takes quite a lot of time and effort to get all of those Northrend recipes. So, I really shouldn't get Northrend Gourmet before Outland Gourmet just because this ONE recipe refuses to drop. It's ludicrous. 55 days and counting here... I have submitted a gm report each day for the last 3 and will continue to do so until I get the recipe... let's see how they like having THEIR time wasted. I suggest all of you do the same until they "fix" this drop rate. So...I've been doing the Dalaran cooking daily since roughly January of this year. That's about 9.5 months of spice bags. So that's what, nearly 270-300 spice bags? Not one Stormchops. Let's add to that the fact that I have -also- been doing the Outland cooking daily for about 4 months. That's another 120 crates of fish or meat and still no Stormchops. You would think that with nearly 400 potential bags I'd have gotten Stormchops by now. And no, it's not in my recipes. hehe I've checked multiple times. Even my husband has checked. At this point I would LOVE for Blizzard to just -give- me the recipe. I'm sick of doing these dailies over and over. Stormchops is the -last- Outland recipe I need for my achievement. The absolute last. I keep thinking of giving up, but I don't think I can. I really want to complete my "Chef" achievement. Please, RNG, be nice to me soon! After 3 months of doing the cooking daily in Dalaran and the one from Rokk in Shattrath, I finally got this recipe today from Rokk's crate of meat...finally! I have also made a post under Lightning Eel if you want to know where to catch them and the success rate. I just got this on my Shaman, seriously I have been some good luck lately. I got to 400 cooking did my first Daily and it was in the bag, I'm standing in Goldshire zapping rabbits! I also submitted a screen shot of it working, takes 72hrs to approve here but here is the picture link for those who want to see it proc. I got lucky and got this recipe from my first ever cooking daily. I almost thought it was common before checking here lol. I can't wait to cook it and try it. Question:.. If you're not in BG and a PVP mob is near, Will this 'attack' them? I am reading how it gets stealthed and also rabbits? so if a PVP'd mob walks by in a neutral area (Ratchet, Booty Bay, or maybe even Dal or Shat) , I'm assuming that this may just strike them also? I've been doing cooking daily's like crazy trying to get this recipe. Guess what. I already learned over a year ago.. DOUBLE CHECK IF YOU ALREADY HAVE IT! RNG is a unfair and outdated mechanic that really needs to be revised. I literally got this recipe on my very first cooking daily I've ever done for any character, while people such as some above have been working hard at it for many months. Personally I think it should be buyable with the Awards at the very least. I got extremely lucky, This dropped on my first Shatt cooking daily in a fish crate. Now on to delicious cake! I've only been doing daily cooking for 1 week! I too have been trying for this recipe for months. I looked in my spellbook and there it was. I have no idea how long it's been there. Like others here, I've been doing dailies in both Outland and Northrend for months and nothing. It's the only thing I'm waiting for to get the achievement. Yes, I did check my recipes and I don't have it. I, too have been doing this for a very, very, long time. I have checked my bags and my recipes still none. I do Northrend and Outland daily every day for the past 3 months. Im hoping posting this will change my luck like everyone else. I AM LOSING my effing mind trying to get this. I don't have it in my bag and I haven't learned the recipe yet. Oh yes, I checked. ggraaahhh1! UPDATE: Oh my goodness, yesterday I read all about everyone's troubles with this. I had no idea it could come in the dalaran daily spice bag. So today, when I did my daily, I had my fingers crossed that I'd receive the recipe...WHAT LUCK! As soon as I realized it could happen, it did. BIZARRE! But awesome :) And as soon as my bid goes through for the waterlogged recipe, I shall be CHEF OAKLI! \/\/007! I got both this recipe and Delicious Chocolate Cake within two days of each other. It was quite a nice moment for me lol. I just got this from a treat bag in Nagrand. Maybe I 'll get lucky and get the chocolate cake recipe that way also. Am I the only person here that has been doing this daily for over 50 days straight and hasn't gotten this thing? I read these posts a long time ago and got excited that I might have already learned it... But nope. Wait..... wtf? I have it too! I've been doing cooking dailies for MONTHS trying to get this stupid recipe and I already have it? /facepalm That was the only thing holding me back from Chef. Sigh. I've done this and the Dal cooking daily for months upon months upon months, and still no sign of this recipe. Is there an easy way to see if I have the recipe stored away somewhere hidden, and that's keeping it from dropping? I can confirm that one can get this recipe from the Orgrimmar daily cooking quests. I suppose that means the Stormwind ones aswell. No way I ever got this out of a drop, they must have slipped it in my recipes! I have been trying to get this for AGES, then because of this post I checked, and low and behold, there it was ,already known. WTF? How could this be? Just realized, wouldn't this be great for the Guild Achievement Critter Kill squad? Supply your guilds a few and get them running about electricuting groups of critters. I got the delicious cake recipe yesterday and then this one today.. I feel super lucky. This is the only thing keeping me from my Chef title. Have been doing both the Shatt and Dalaran dailies since the beginning of Wrath of the Lich King. The RNG hates me! IT HATES ME! I got this in my first daily bag from Dalaran today. I got this today from a Reinforced Crate while fishing in Northrend. i just have to say i came hear hearing about 2 recipes that were really hard to get i already have the cake....so after finding out about this recipe i turn in the daily for outland and there it is i was like omg no way! I got this at my 4th rokk's dailies day! I was very lucky on this side, if the drop rate is right, because from it it could take from 40 to 120-160 days to get it; instead I think I won't be so lucky with the other very rare recipe, the cake, it's the only one missing so far. Ah, by the way, I got this from the crate of meat, for sure; the first days I always chose that. Very wierd. This recipe and Skullfish Soup recipe were the only two that I had left to do about a year or so ago for the Outland Gourmet. I got sick of trying to get the dumb things and gave up. I checked my recipes today, and for some reason they are there. No idea why. Seems to me that they may have popped up at the cooking trainer a few months ago, and I just trained them without even realizing it, but I'm not sure. 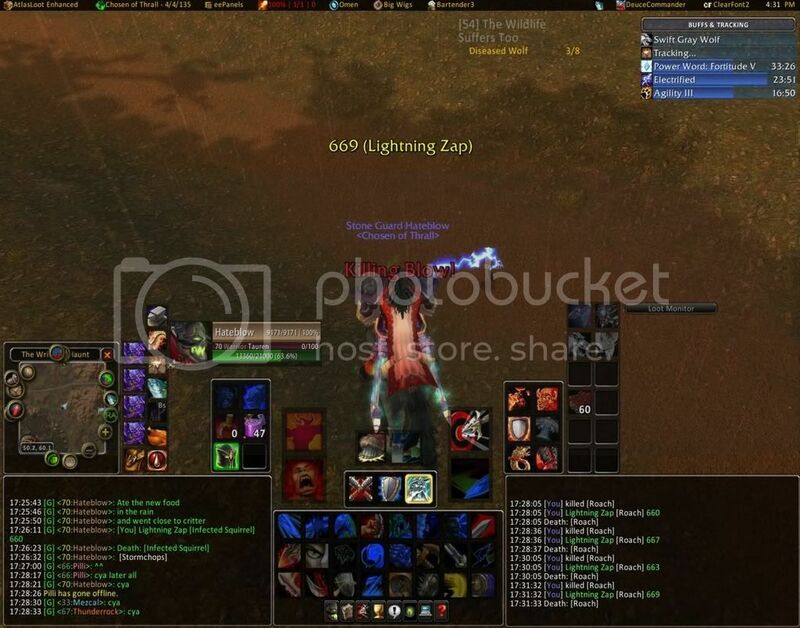 Looks like Stormchops and Cake recipes drop was boosted (finally) today. Think there was some quick fix applied during night and got both recipes right after daily reset, one from Dalaran daily, 2nd from Outland daily. Was farming them for last 2 months, every day. Took me a month and a half to get this recipe. There I was, so happy for finally getting that chocolate cake recipe. No more hunting for a stupid low drop recipe from daily cooking rewards. And then I discovered Stormchops. Could someone please kill me? This just dropped from the fishing daily bag in Dalaran. What a nice surprise. :P Happy hunting! For the crate of meat, I did the math. 2% chance of getting it is about doing the daily 50-51 times. But sadly I've done Rokk's daily way more than that, as well as I do the Dalaran dailies every day and it's never dropped from the spice bag. I've opened roughly 350 spice bags. I don't have the recipe, it's the last thing I need for the Chef title. ETA: 5 days after I posted this comment...it dropped from the Crate of Meat. Just got it from the Dalaran Cooking Daily aswell. I have been trying to get this recipe for a month now. This is the last recipe I need for my Chef title. I am losing my patience with this recipe. Does anybody know if there is another way to get this recipe besides spice bags and cooking daily? Received this on my first cooking quest in Dalaran. After two months of grinding the Outland/Dalaran cooking dailies I FINALLY got the Stormchops recipe less than a day before MoP launches and Hail to the Chef achieve likely has Pandarian achieves added to it. Hoping if I complain about not having this recipe after 8 months of doing both dailies nearly every day I will get it.....yeah. right. Holding my breath, I did another Rokk daily today. I haven't been on this toon for months and it was the only recipe I had left for Outland achievement. Maybe because it was so long, like someone else had mentioned, I got mine from Crate of Meat today! GL to you still waiting...it'll happen. Im on it for a couple of years now. Everytime when im in Shattrath i go for the daily cooking quest. No result yet...does it even really excist? Use: Teaches you how to cook Stormchops. Use: Charges you with energy, causing lightning to occasionally zap nearby enemies for the next 30 min.